FAQ – Learn JP MÜLLER'S 15-Minute Full Body Workout "MY SYSTEM"
Q: Are there any videos available (besides the Slate story) of all the exercises being done? A: Yes! 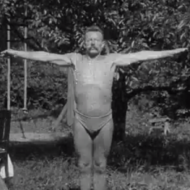 A fellow Müller fan recently emailed us a link to some amazing footage of J.P. Müller himself demonstrating the exercises. There are two videos from the Denmark Film Centralen. We haven’t put together our own video yet, but we’re working on it! This is our top most requested item and we will post and update when we have it. Q: I purchased the Kindle edition (very helpful thank you) and I am trying to find and print the 6-Week Tracker Worksheet. Where do I get it? A: For now, email us, ( support@learntomuller.com ) and we’ll send it over right away. And soon, we’ll have an automated system organized so you can download it using a code in the back of the Kindle book. Q: What happened to the Amazon Kindle version? A: It’s back! Check it out here. Q: I’ve been doing my system for a few months and have question about the “deep breathing”. When you do the deep breathing do you start with you head leaned back and then start the inhalation or do you lean your head back during the inhalation? A: We have reviewed the original text in the book and it appears that Muller’s intention is that your body should move naturally with the breath. We believe you should start with your head in a normal position and allow the breath to fill your chest and naturally lean your head and torso back — but you’re not actually actively leaning your head back. Q: Any chance of a hard copy? A: Unfortunately, we haven’t gotten our hard copy version together yet. A print on demand version is in the works, but it’s still a ways off. The PDF pages are intended to be high enough resolution for 8.5 x 11 printing. Q: Can some of the exercises be modified? I am healing from an injury. A: Unfortunately, Muller only provided a few modifications and those were to accommodate different levels of strength, not injuries. We ourselves are fitness enthusiasts, but not experts and we don’t have formal training — so we’re not in a good place to recommend modifications and ensure that they are safe and effective. Send us a question! We will post the answers here.